← A Pair of Ultimate Trousers! 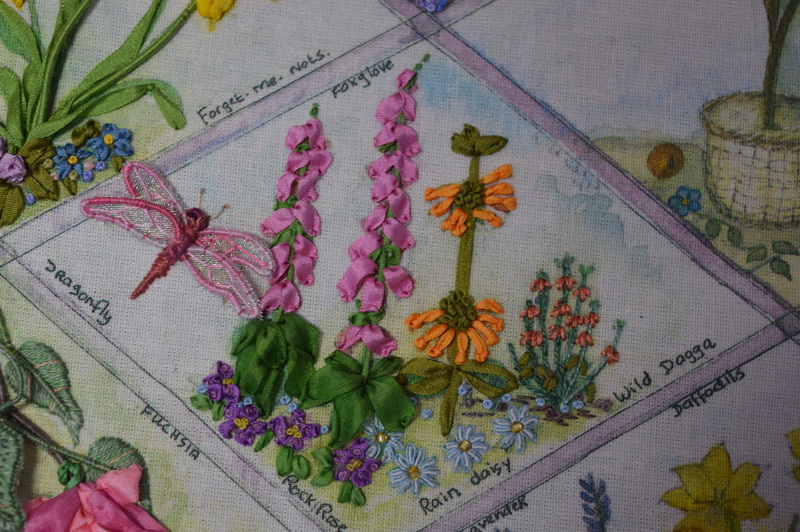 The next diamond was foxgloves, rain daises, wild dagga and rock roses, together with a very dainty dragonfly. 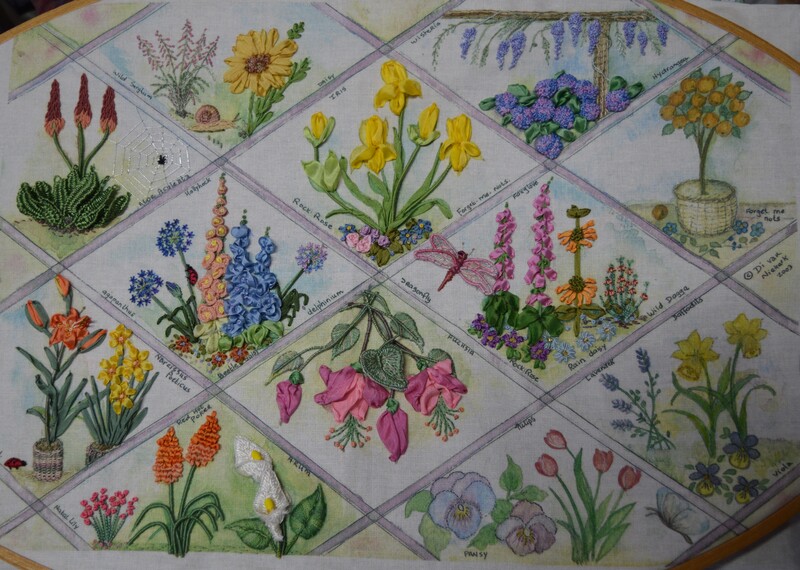 The first to be stitched was the foxglove. I didn’t have quite the right shade of green for the leaves so I overdyed a pale green ribbon, it came out a bit uneven but I really like that effect, a bit more realistic! 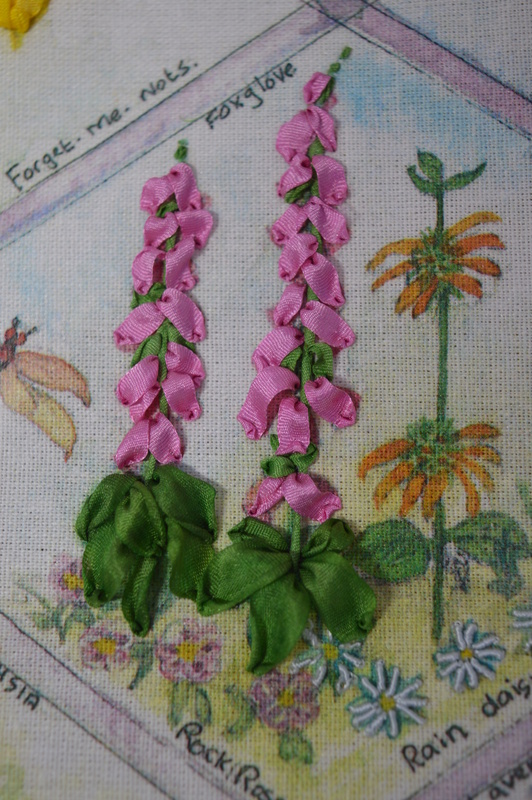 The foxgloves were just stitched with a simple ribbon stitch so they were fairly quick to do. I’ve never heard of Wild Dagga so I had to google it to see what it looked like, it’s a bit of a funny looking plant and the links for legal highs was a bit disconcerting! The instructions said to use one long straight stitch of 4mm wide ribbon for the stem, the picture shows it lying flat, when I’d finished it I felt it looked too wide and dominant, so I put a little stitch in top and bottom just to narrow it a bit, I think it looks much better. The flowers are made with silk ribbon using green french knots for the centre and orange pistil stitch for the flowers, pistil stitch is basically a french knot on a stalk! The smaller wild dagga was meant to have stems of ribbon too, but I felt they would be too bulky so I used a soft perle thread which looks fine. The flowers are in a silk thread. I’m beginning to think the silk thread I bought off ebay is completely different to the silk thread the designer uses. Mine is very very fine, the instructions called for straight stitches in one strand of silk thread, well you wouldn’t be able to see them if I used a single strand, for these I actually used the whole thread, so all six strands. 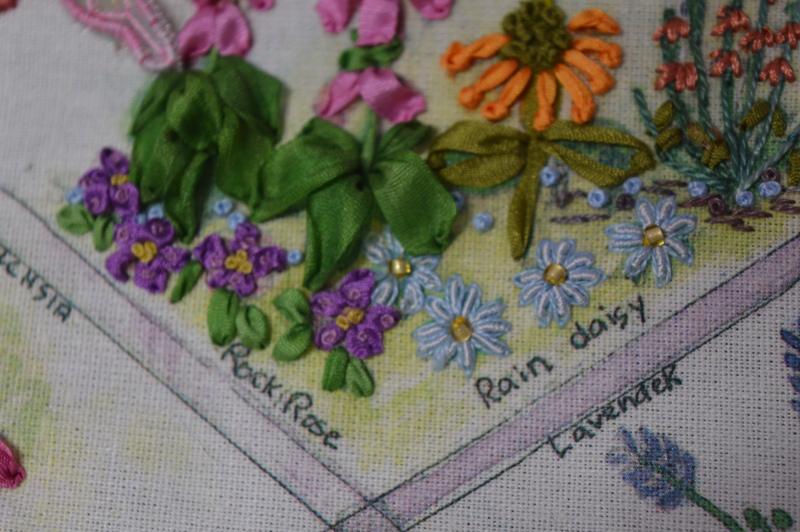 Rain daisies are osteospermums (I learn all sorts with sewing!) Again the instructions called for bullion knots using a single strand of silk, well the weedy one on the left is using a single strand, the rest have three strands and about 6 wraps. The lazy daisy stitched after in pale blue around each bullion just finish them off, it’s very effective. The little rock roses are stitched with little ribbon straight stitches with french knots on top. 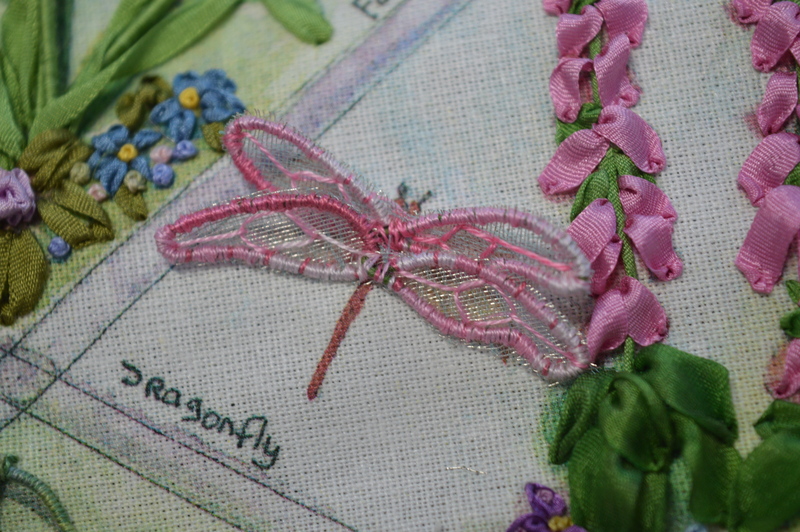 The last thing for me to embroider was the dragonfly. The wings were stitched on organza by couching over shaped wire laid on the organza. I bound my embroidery hoop with seam binding to help it hold the organza firmly. The instructions called for disolvable fabric under the organza. This would then be melted away afterwards. I must admit I skipped this bit as I was concerned it would leave the stitches a bit loose. I also changed how I stitched the wings a bit too. The instructions had you making each wing separately, the wires are then poked through to the back of the fabric. Two sets is four wings, each with a wire from each end, so that would be eight wires to get through the fabric. I felt this was rather a lot of wire so I made mine in a figure of eight and crossed my fingers that it would work! There’s a butterfly to stitch in a few weeks too, so I decided to embroider all the wings at the same time. 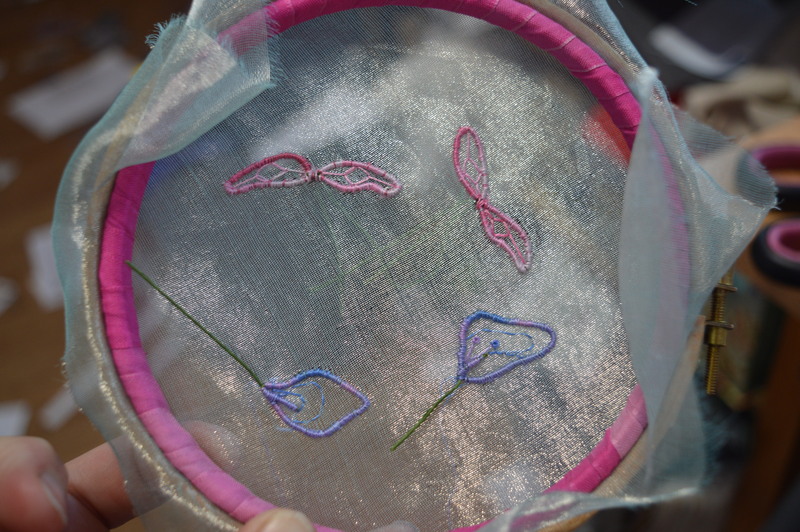 Having couched round each wing and added a few embroidered veins, I very gingerly cut round each wing, cut the wires to about an inch long, made a hole with the biggest needle and could find and poked the wires through…to my relief they sat nicely on the fabric. The tail is embroidered with stranded cotton, just couched over three long stitches. I managed to secure the wires at the same time underneath.I decided to use a gorgeous thick thread from my embroidery box for the body, it’s too think to actually stitch with so I folded it in half, secured it at the top of the tail with a single stitch of thread through the loop, made some cross-stitches across the thorax and then (keeping my fingers croosed again that it would work!) I simply tied it in a reef knot to create the head. I trimmed it close and then secured it with a couple more stitches. The antenna are stitched with a single silk thread. My dragonflies body doesn’t bear close scrutiny but I love her wings, she is very dainty. I’m now three-quarters of my way through this project, having stitched nine out of the twelve diamonds. Next up is the orange tree, I’ve got my beads ready to bind in ribbon! There’s quite a few of us taking part in the stitch-a-long now, everyone is stitching their own project, so please follow the links to see their progress, there’s some gorgeous embroideries to see. 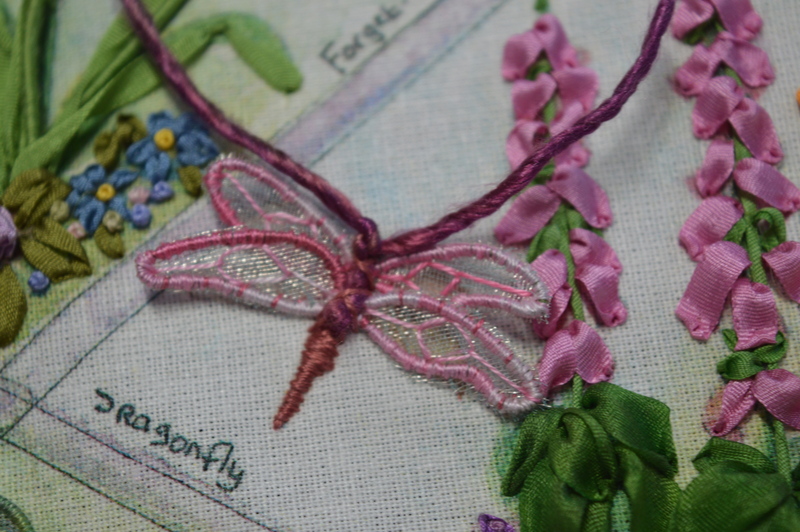 This entry was posted in embroidery, Serendipity, Stitch-a-long and tagged Di van Niekerk, Dragonflies, Silk Ribbon Embroidery, Stumpwork embroidery. Bookmark the permalink. This was a tremendously fiddly section, so congratulations on getting it finished! Lots of patience has paid off beautifully, and I think what you’ve done is probably even nicer than the designer’s intention. Thank you, I like doing ribbon embroidery and it does grow a lot quicker than the stumpwork! Thanks Debbie, I feel I’m making good progress now! Lots of flowers in this one, my goodness! I love the rain daisies, and the dragonfly is amazing. Those wings are really something! Gosh, you really have done a lot this time! I love your little dragonfly. I’m most impressed at your dying ribbon skills, it looks great, and fits in with the piece beautifully! It is quite a busy diamond! I’m just using my silk paints to dye them, it takes 5 minutes as I can iron them dry and that sets them too. The tutor at Denman said it wouldn’t dye them properly like fabric dyes, but I still haven’t worked out why! 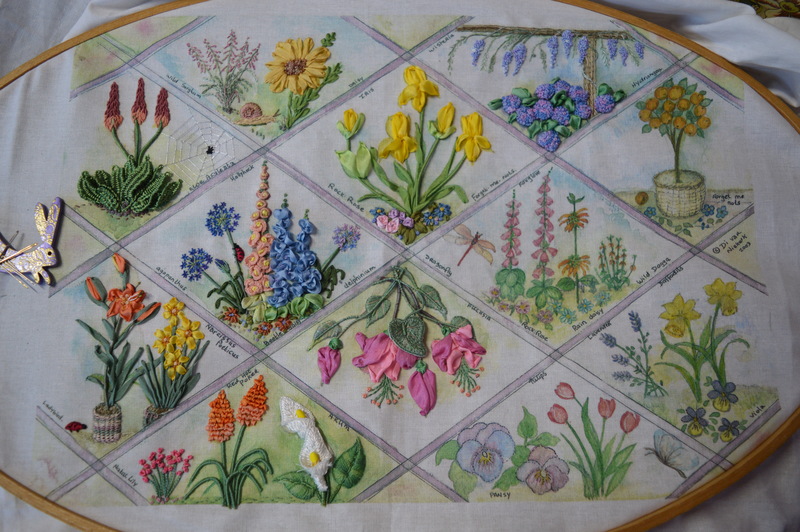 Oh I love foxgloves and yours look so realistic (as do all the flowers in this piece). The dragonfly is exquisite!! Thank you, I love foxgloves too, I keep planting them in my garden! Great progress. I think this is my favorite one so far. Beautiful stitching. Thank you, I keep changing my mind as to which is my favourite! I love the dragonfly. It looks like it is gonna fly away any moment, so real! I love it too, I’ve a butterfly to make soon too! Beautiful, Wonderful Stunning, Fantastic work as always – I feel like I keep repeating myself but this is so stunning and I am so in awe of your talents. Thank you, it has certainly pushed me out of my comfort zone doing this, but the instructions are really good. This looks like a lovely sampler with so many different techniques to get stuck into to. Thanks, there are lots of new stitches and techniques for me to learn! Wow, there’s so much in this section and it looks stunning. I love that dragonfly. His wings are amazing! Thanks Carole, it does seem busier than the others, lots to stitch! The way you altered the pattern to use less wire on those dragonfly wings was a great idea! They look amazing 😍 The flowers all turned out lovely. Thanks Christina, I wouldn’t have liked to try and put 8 pieces of wire through, I was just worried it might distort and tear as I pushed it through, thankfully it didn’t! Ok Margaret, My projects looks completely mediocre next to yours! That Dragonfly it stunning! Thanks Mary, but you’ve designed yours yourself, that takes a huge amount of skill! Wow your dragonfly is amazing. Your piece is really coming along. Thanks, I’m making good progress now! Your stitching brings embroidery to a whole new level. This piece is magnificent!